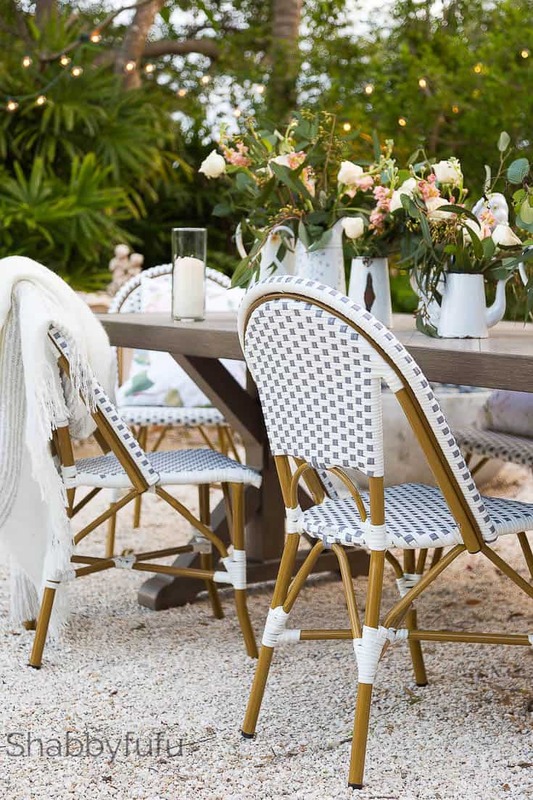 French coastal style is something that I seek out to emulate in my home and garden. I haven’t really shared much of the before/after of our garden and pool and generally only post the “money shots”. 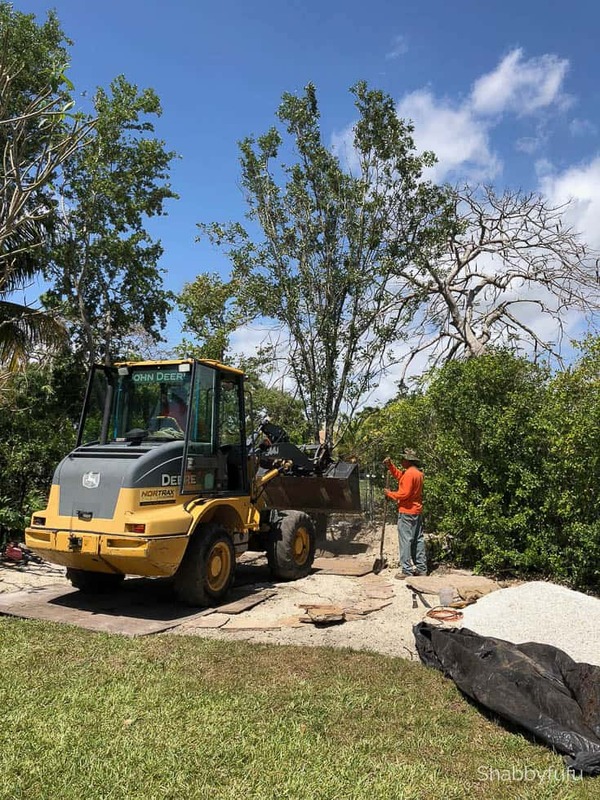 Money indeed and thankfully we’ve put aside enough to restore our damaged garden that suffered greatly from Hurricane Ivan last September. Did you know that most homeowners insurance doesn’t cover landscaping or fencing? All looks pretty good now and I’ve recently shared the wedding reception held here for our daughter, which pushed us to get things accomplished pronto! Here’s an untouched shot from sunset last night taken from my iPhone proving it’s definitely a place worth putting work into. 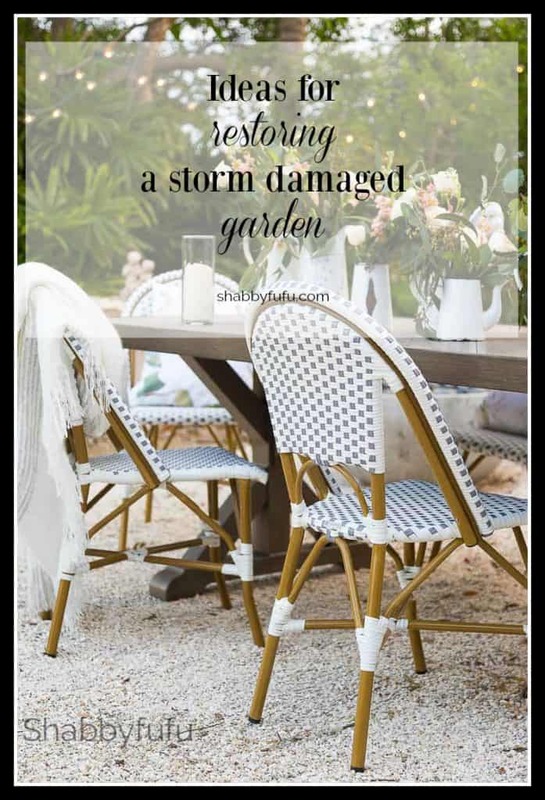 Today I’m excited to be partnering with Antique Farmhouse in the Gardening and Outdoor Entertaining Blog Hop and there is a $500 GIVEAWAY at the end of this post, so keep reading to enter! We’ve been through a lot in this home over the years! In THIS POST I shared the devastation of a hurricane and how it looked back here 25 years ago right after we moved in. Something like that brings you to your knees and shakes you to the core. For us made us so grateful for every day living and what we do have. I digress to happier times and how things look now, but it took a village and lots of work! Our covered patio hosted the guest for dining at our daughter’s wedding. No surprise that I used lots and lots of vintage pieces and flowers. She specifically asked for a French coastal style (lucky me!). Out in the back is the newly refurbished dining area where we added fresh landscape, planted trees and beefed up the pea gravel. We don’t have the equipment, energy or know-how to take on massive projects like this. We worked closely with our landscaper and pool renovator in designing the spaces. 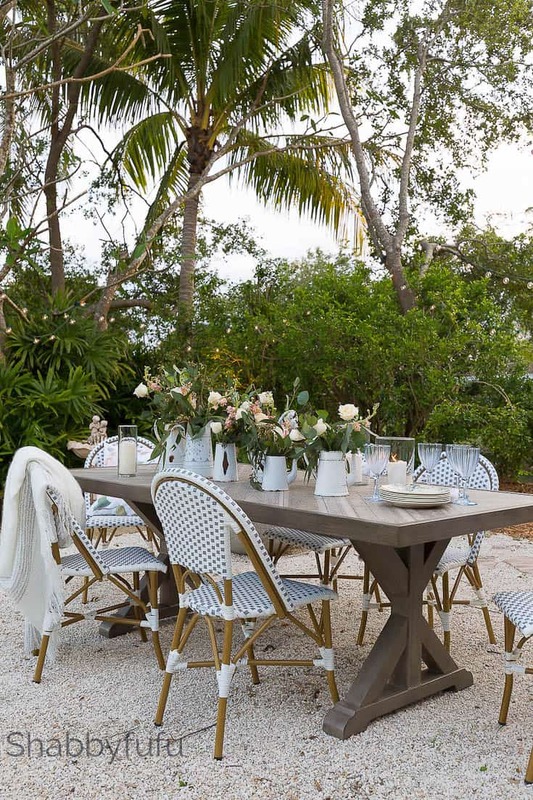 Twinkling lights and this amazing outdoor table that looks like wood, but is not! Find the table HERE and the super affordable chairs HERE! I love the French country farmhouse feel out in the garden and there were certain things in the planning that I insisted on. The pea gravel patio is perfect for that casual relaxed French bistro look. I talked about this outside area in THIS POST and we’ve been eating out here often! Today I’m excited to be included in the Gardening and Outdoor Entertaining Blog Hop and partnering with my friends at Antique Farmhouse once again! Be sure to scroll down to the bottom of this post to enter a GIVEAWAY for $500. I hope that you visit my friends linked at the bottom of this post: Leslie of My 100 Year Old Home, Jill of Gathered Grace, Karan of Designs by Karan, Kim and Lacey of Styled With Lace, Sarah of Dreaming of Homemaking and Kristi of The Pickled Rose. There are definitely a few things that I have my eye on to use in the garden! 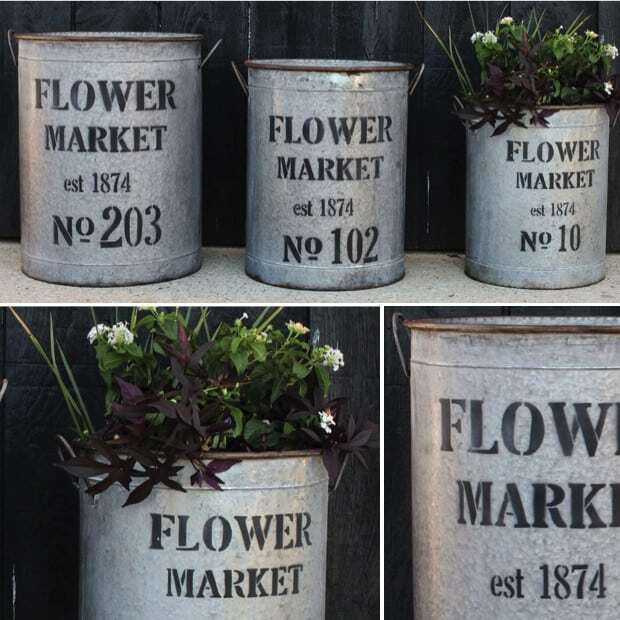 With my decorating theme being French coastal style, these FLOWER MARKET BUCKETS are on point and useful. Find them HERE and the price for a set of 3 is so right! Adding flower containers to a patio or outdoor spot are the finishing touches and jewels of the garden! 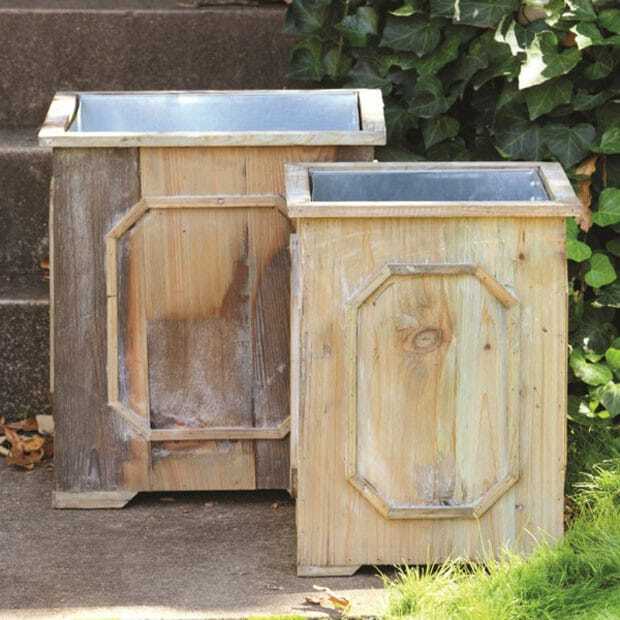 Looking over Antique Farmhouse’s offerings I’m pretty obsessed with this set of two RECLAIMED WOOD PLANTERS. Find those HERE and just having come back from my European trip I saw similar ones at a much higher price point. Willow planters are often seen in the French countryside. Find the WILLOW PLANTERS at Antique Farmhouse HERE. Wow – that’s a project! And it looks like it’s been there forever! So warm and inviting and comfortable. You’ve done a brilliant job – not surprising in the least! 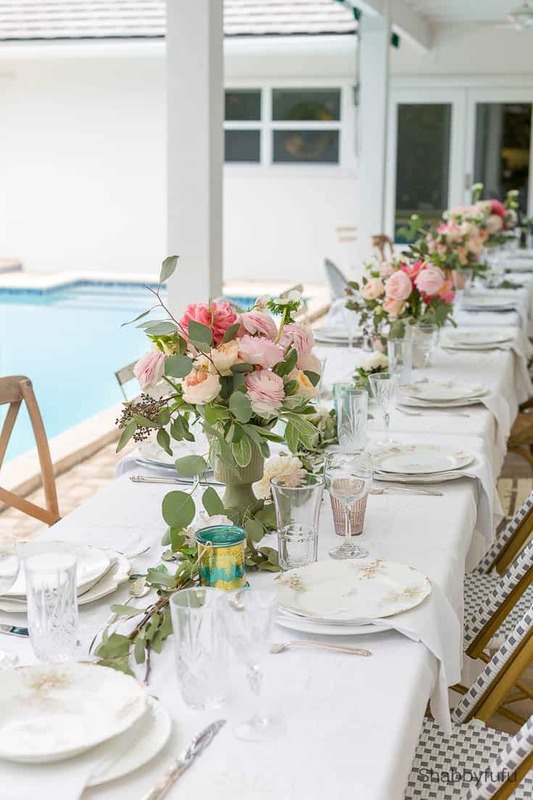 The table setting for your daughter’s wedding is splendid – truly. It’s magical and romantic and beautiful, and still very down-to-earth and ‘real.’ I just love it. Thanks for sharing your Hurricane Ivan recovery … you’ve mended ever so well! Hi Janet! Yes, your outside space is gorgeous! It definitely says French Coastal! Thanks for the giveaway! I’m really enjoying seeing some of these new blogs from the giveaway! So important for bloggers because that helps grow their readers and that’s how I found your blog!! Love Antique Farmhouse! Although more on the coastal side of decor, there are farmhouse decor that mesh well with the coastal vibe! Blessings and Happy Monday! Wow, that is SOME damage. I am so happy that you were able to restore your amazing outdoor space. That took a bunch of work. The end result is beautiful. You will enjoy your outdoor space for years to come. Wow, I love how this turned out! I really need to make our garden look more presentable. It’s pretty shabby at the moment. Great giveaway! Love how it turned out! Beautiful Transformation.I can imagine the gardens in France! The tablescape looks beautiful. All that damage must have been devastating. I’m glad you were able to rebuild. Wow! You did an amazing job! Such a pretty oasis! I am sure after all that hard work you are enjoying every bit of it! Wow it looks amazing. I love how you pulled it all together. Monica… I just entered the giveaway and signed up for newsletters. Thanks for a great giveaway! Terrific news Monica….good luck with that! Love the French farmhouse look! Your blog posts totally inspire me! 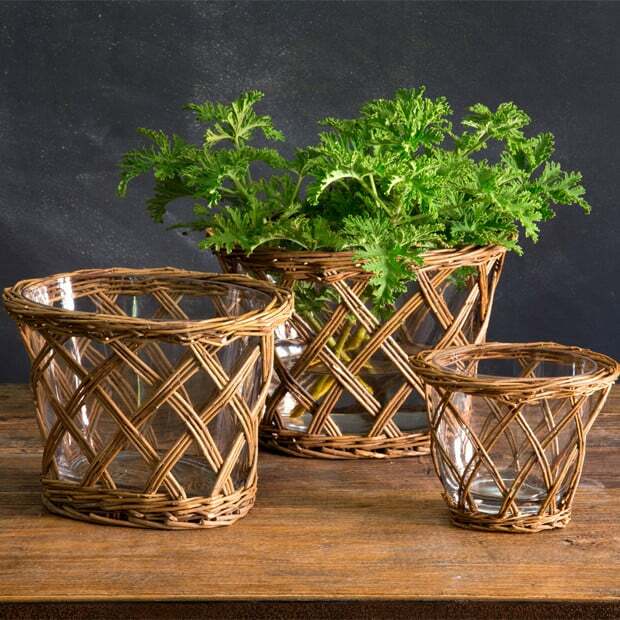 One note though- the willow basket vases start @ $18 for the small one, not for the set. The whole set becomes pricey. Everything looks lovely, I love the intimate setting for a wedding dinner. We survived Sandy ourselves but there are people here still rebuilding years later. I have a few friends who had major damage from Sandy and hurricanes can really be devastating. Thanks for stopping by! Gorgeous backyard! The arrangements on the tables are lovely! I love living in South Florida but the hurricanes definitely scare me! I have PTSD when I hear that we are under a hurricane watch! After our home was pretty destroyed by Andrew years ago it isn’t anything I’d wish to go through again! I think it turned out wonderfully! It’s really awesome to be able to renovate your garden and turn it into this beautiful place where you can hang out and entertain family and friends! Perfect for making the most out of the season! Thanks Karen…we love hanging out there! Janet, this is so incredible. You guys did so much work, but as you can see its all worth it. I still can’t get over how beautiful! Great job! Thank you Sarah…it’s been a labor of love and we love hanging out there! Fun partying with you today! Wow what a big product but I bet it was so worth it in the end, after all you beat sitting out in a lovely garden in the summer. Thanks Sarah…just hoping that we don’t get any major storms this summer! Janet, this is so gorgeous. I couldn’t imagine what you went through. You’ve come ceeated such a beautifully designed space. Hello… sunset pic looks spectacular !! Your yard all spruced up looks great. Can’t wait to see more pics when you incorporate the galvanized French look containers and the weather d containers. My friend ordered the galvanized containers (and did not read the sizes). WoW they are big ! She revised her plan and will be using them outside. They are PERFECT. Thanks Barb…we love our pool and it really needed that update! Such a beautiful backyard! Your french country touches just elevate the warmth and romance of such a pretty private garden. So much inspiration! Thanks so much Maureen….I’ve just come in from outside and doing some weeding. A great place to be! Such a beautiful outdoor space Janet. 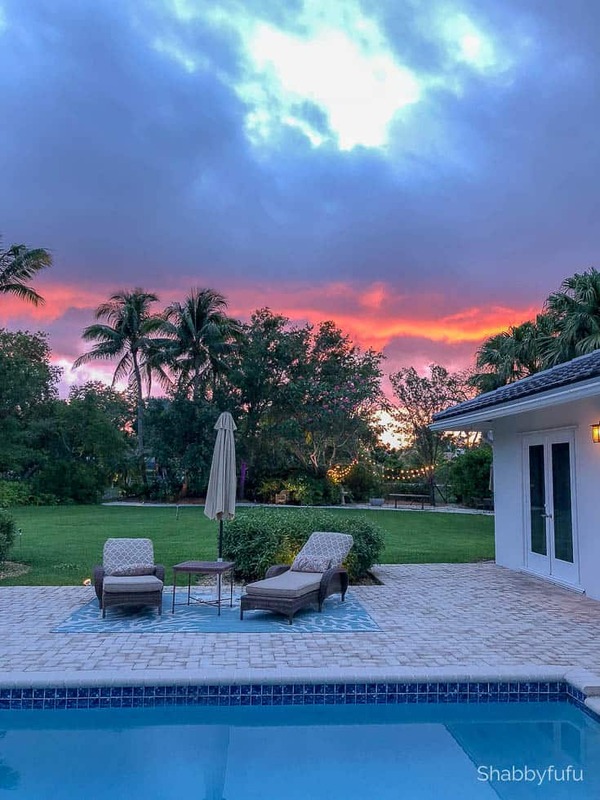 Of course living in a warm climate has it’s perks in that you can enjoy the outdoors almost year round and you certainly have turned your backspace into an oasis. Thanks Mary….we do love our garden but the too warm/hot season is coming soon! Your backyard is simply stunning. Love the transformation and decoration theme that you have. Everything fits perfectly in the space. Soooo many great ideas! I entered this amazing giveaway! Wow what an ordeal to go through! Mother nature is so cruel. But, you survived and made your garden to look AMAZING and dreamy! wow… stunning garden! Where did you get those enamel flower vases? So rustic, pretty! Thanks Rika! They are antiques that I’ve collected over the years from France. I love the tablescape! The flowers on it looked so beautiful! I can easily see them on a rustic buttercream wedding cake to go with it! Awesome backyard! I bet you will have great parties this summer! What a project!! I love the seating and flowers, it’s so pretty!!! Upgrading any part of your living space is costly but it’s worth it. Yours turned out lovely. You have certainly had your hands full putting your backyard back together. But please know your efforts have been well worth it. Everything is beautiful! 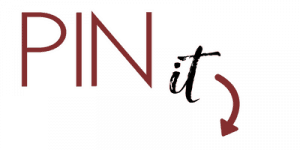 It’s been so much fun doing this blog hop with you! Janet Your yard looks amazing and what you’ve done is so inspiring, as usual! Your daughters wedding looked like a dream! Love doing this hop with you! This turned out fabulous! I love the flowers and the colors. most importantly, the simplicity of all this. This reminds me so much of how I need to work on our garden the next time we come back! It’s not easy but it’s possible! I love your ideas! Everything looks gorgeous! Signed up for the newsletters of those not already subscribing to. Thanks for the giveaway! I’m a ‘neighbor’ from Georgia. The .brilliant sunset photo is breath taking! I hope some of your guests got to witness it. I feel your pain, as a South Florida coastal native as well. And, sadly having to start over 4 times now. Gah, one divorce, one fire because of kids in the woods and two Hurricanes. We had the worst hit with our historic back to back Hurricanes in 2004 Jeanne and Francis. THE worst, lost roof, fought forever with insurance people. Then, hit with Irma last year. Now, trying to get insurance again for the house. Sometimes I wonder if it is worth it. But, it is we live in paradise. Me ten miles in. We have so much in common style wise, age and more. Yes….and there is no perfect place, so we sometimes have to deal. Hoping for the best season though for sure.